SAVE! Get the 2-Book Bundle! Click here ! Format: This book is a PDF. 8.5X11, 130 pages. Wait! Click here to save! "How to Work with Headhunters answers every question ever asked about recruiting—how it works, who are the various players, how you connect with them, etc. The tone is friendly, the language is easy, the explanations are complete, and best of all the How to Say It suggestions give you the right way to ask questions, encourage contact, and negotiate your role in the process. Absolutely marvelous and highly recommended." "I just downloaded How to Work with Headhunters. EXCELLENT! I will recommend that each of our Executive MBAs get this book. It's a very comprehensive treatment of every aspect of recruiting, search firms, career management firms and more. I especially like the Back of the Napkin section at the end. Looks like you thought of everything!" "Why am I flogging How to Work With Headhunters? Easy. It speaks my language... really worthwhile advice from someone from the recruiting world who is willing to be transparent in an effort to help people. "The book contains the answers to 62 'in-your-face' questions, and in-your-face is the right phrase. Nick's writing style sort of suggests to me an image of Howard Cosel with a sense of humor." "Mr. Corcodilos teaches you how to avoid bad headhunters and how to cultivate the true professionals. This advice alone is worth the price of the publication. This book will teach you how to become your own headhunter for those of us who may not be prime candidates for the three percent club. That may be the most compelling feature of this intriguing, informative and useful career book." with the career-changing job you're waiting for? You can't afford not to know. . .
What makes headhunters tick? How can you put them to work for you? Nowadays, you don't have to be an executive or even a manager to get a call from a headhunter that could dramatically boost your career. Do you know How to Work with Headhunters? 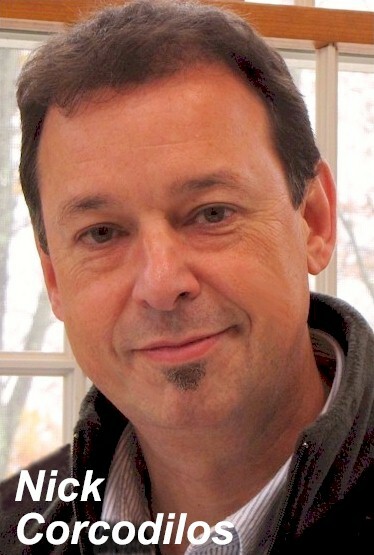 Nick Corcodilos started headhunting in California's ultra-competitive Silicon Valley in 1979 and is host of the acclaimed Ask The Headhunter website. With this provocative new guide, Nick continues the contrarian, candid Q&A he started online in 1995. Nick invites "fearless job hunters" to listen in as he turns the myths about recruiting inside-out and reveals how to identify the best headhunters while avoiding the charlatans. 62 in-your-face questions answered in a 130-page guide that reads like a series of conversations over a cup of coffee with the headhunter who put the profit equation back into job hunting and hiring. What's the secret to getting on a headhunter's list? 130 pages packed with how-to insider tips and advice that will change the way you deal with headhunters forever! "Talking with you over coffee would be easier than writing a book! But How to Work with Headhunters is still a conversation we can have... for a lot less than you'd spend on all that coffee!" Want to be the headhunter's #1 candidate? Nick explains how headhunters operate—and shows how to leverage them to your advantage. How can I boost the salary range for a job? How do I save my résumé from the trash bin? Don't blow it when a headhunter calls: Learn how to advance on opportunities, control the risks, and manage the experience. How should I qualify a headhunter? Recruiters, agencies, coaches, headhunters—which ones are the real deal, and which are the quacks? Nick reveals the gotchas, explains how to turn a phone call into a long-term source of opportunities, and how to avoid disappoinment. Negotiate better deals: This guide for fearless job hunters unravels the negotiating tactics headhunters use and teaches you how to optimize any job offer. Find out how headhunters boost offers by "splitting the offer" into the job and the terms—and learn how you can do it, too. The author answers 62 of the toughest in-your-face questions about headhunters and their proven methods culled from 15 years of Ask The Headhunter Q&A. "When I tell you how to deal with a headhunter, you need to know How to Say It. That's why I've included over two dozen call-outs to give you the words that give you control. But there's more. Want to know how I know what I know? This guide includes the Insider's Edge—what the pros know that can make or break a job search. Add it all up... What's it all worth?" These features alone make this the must-have guide for fearless job hunters who want to know How to Work with Headhunters to get ahead! BONUS: A 5-page crib sheet to guide you through any call from a headhunter. What's the best deal on the edge you need?
. . . The phone rings. It's that career-changing call. Can you afford not to know How to Work with Headhunters? Just $39.95. Get the edge now! "62 myth-busting answers to the common questions most job hunters have... While working with a reputable headhunter can open doors, relying primarily on headhunters to find you a job will likely result in disappointment... That said, a good headhunter with an attractive offer can change your life for the better, so it pays to know how to deal with them for best results. And that is what this book is all about." "How to Work with Headhunters is the essential guide to headhunters for the serious professional—it contains insights that you will find nowhere else. 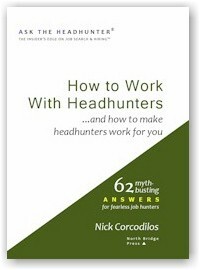 Nick Corcodilos uniquely distills what you need to know and what you need to do to make headhunters work for you."